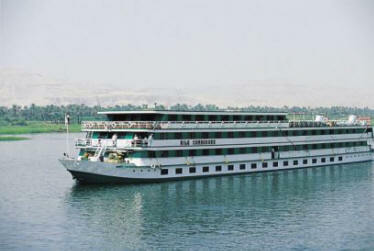 Economy Nile Cruises are only valid for a minimum of 2 passengers traveling together. A private guide is provided in Luxor and Aswan only. The ship provides a guide for all other ports. Morning embarkation before lunch. Visit the temple of Karnak, a series of temples built during different reins of pharaohs with the Avenue of the Sphinxes. View the impressive Avenue of the Sphinxes, then continue to Luxor temples on the East bank of the Nile. Lunch, dinner and overnight on board in Luxor. Next is the West Bank to visit the Necropolis of Thebes with the Valley of the Kings with their richly decorated underground burial places as well as the temple of Queen Hatshepust, and the Colossi of Memnon. Each colossus, including the pedestal and the crown, is about 21m tall and represents King Amenhotep III seating on his throne, wearing the Memes, or royal headdress, Afternoon sail to Esna. Cross the lock. Sail to Edfu and overnight. The ship will moor at Edfu for overnight. Morning visit of the temple of Edfu. It dates to the Ptolemaic period and was dedicated to the worship of the god Hours represented as a falcon. It is one of the most beautiful Egyptian temples, distinguished by its huge splendid structure that blends Pharaonic and Greek architecture. Its grandeur competes with Luxor temples. It is the second largest temple after Karnak and it also houses the Nilometer and a huge monumental gateway entrance. Sail to Kom Ombo. p.m. Visit the double temples shared by the two Gods Sobek, the Crocodule dog of fertility and Hathor, the Goddess of Love and Joy. Sail to Aswan and overnight . After breakfast visit of the High Dam and the temple of Philae. After lunch sail by felucca (wooden boat) to see Elephantine Island and the view of the Agha Khan Mausoleum. Overnight in Aswan. Morning disembarkation, transfer to the airport. Possibility for optional tour to the famous temples of Ramses II. and his favorite wife Nefertari at Abu Simbel. Side trip by flight is US$ 347 per person (3 hours) or by land ($167, 8 hours). Excursion to Abu Simbel has to be booked together with the cruise. a.m. Embarkation before lunch. p.m. Afternoon free at leisure. Overnight in Aswan. a.m. Visit of the High Dam and the temple of Philae. Sail to Kom Ombo. p.m. Visit the temple shared by the two Gods Sobek and Haroeris. Sail to Edfu and overnight. a.m. Visit the temple of Horus in Edfu. p.m. Sail to Esna. Cross the lock. Sail to Luxor and overnight. a.m. Disembarkation after breakfast. Cross to the West bank, Visit the Necropolis of Thebes, Valley of the Kings, the temple of Queen Hatshepsut, and the Colossi of Memnon.